It's standardized testing week in our homeschool. You knew I would have some thoughts about this if you've been following along on my Facebook Page! We are required (per law in the state of Georgia) to test once every three years, beginning in the third grade. My sixth grader and second grader are both taking the ITBS. HSLDA has a comprehensive article about testing on its site. I suggest (if you have questions about what tests to take, etc....) that you read it carefully. *This post contains affiliate links. Please see my Disclosure Page for more details. Standardized testing is so FOREGIN to my children, but I'm thankful to be able to test them in our home and use the results for my own purposes (which will be putting them in a file and keeping them on record should anyone ever need to see them). You already know that I believe we cannot STANDARDIZE OUR CHILDREN. Ask a child sitting near you if they can name what the arrow is pointing to. The correct answer is FILM. In this section of the second grade ITBS listening test a child is supposed to bubble in under a picture that has a certain vowel sound. 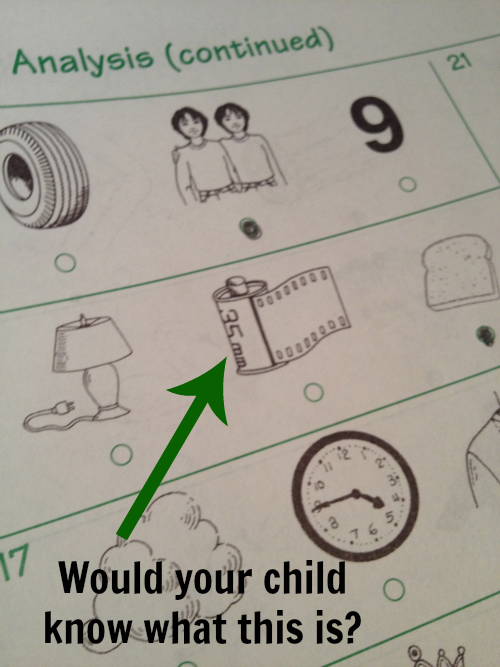 This particular question stumped my son - because he had no idea what 35 mm film was! I've spotted a few other questions like this, too. This was just the most glaring example. If you only read REAL, LIVING books in your home then a standardized test will most definitely insult your child's intelligence. The reading passages are twaddle (textbook like examples that are just fluff) and the comprehension questions are surface level at best. What's really sad about this is that these reading passages are what children are given as a steady diet in our public schools. So, I guess a standardized test might not insult the average public school child's intelligence. I've found the math portions in both the sixth and second grade tests to be very true to what my children are currently studying in math. My daughter (who is completing Saxon 7/6 homeschool math) is faring fine with the math. It's hard for her, but math isn't her strong suit, and this will give us an idea of some concepts we can work on during the summer. My son (who is completing Saxon 3, but technically in the second grade) found the math very easy. Math is his strong suit. In our liberal education world, testing is everything, right? If your child does well on the SAT they have a better chance of getting into a good college. Getting into a good college assures your child of a good job one day -- or maybe NOT. Our world is changing in this regard (but that's a completely separate post, isn't it?). Testing your child on a regular basis prepares them to play the testing game, so you need to decide if you want to do this. Some people don't have a choice, because of state requirements. I have a choice and I know what it will be. I will expose my children to just enough testing so they will be able to cope with larger tests as they get older. I don't want to put them at a disadvantage, but I want them to know they are MORE THAN A TEST. "Bubbling In" is a foreign concept to children who have never been in school. The only reason my son knew how to do it was from our spelling curriculum, Spelling Workout (which we LOVE). This curriculum takes on a similar format to the spelling portion of the ITBS, so it's good preparation. My daughter (who was in school until third grade) knew how to bubble in. "Be sure to get plenty of rest and eat a good breakfast!" - school speak! If you can afford to send your child for testing, do that. Our homeschool group offers yearly test administration. We did not take advantage of it this year because I wanted to save some money and do it at home. My son is more free to complain (he's a perfectionist and come unglued when he doesn't know what a picture of 35 mm film is!) with me and I think would do better testing with someone else. I can administer my kids' tests because I have a Bachelor's Degree (I ordered the tests through Seton Hall). It was approximately $80 to rent the test booklets and have them scored. So, I'm still paying money by doing it myself. Don't Make A Big Deal About It! I'm trying not to make a big deal about our testing, especially for my youngest child. "Why are you reading me this stuff when you normally read me such beautiful literature?" I tell my kids these are required tests from the state. I also emphasize to them that the state needs a way to make sure kids are learning things and I leave it at that. They already know we don't subscribe to the educational philosophy of the public schools, so it makes sense to them. With that being said, it does teach my children that we sometimes need to obey by rules that don't make sense. It shows them I have a healthy respect for authority - and I can voice my opposition to these tests in a logical, reasonable manner. I'm curious... have you tested your kids yet? If so, what test did you use and did you administer the test? Does your state require testing?